The spinal cord plays a critical role in processing somatosensory information—touch, temperature, pain and itch. Our lab is interested in characterizing these spinal microcircuits. This knowledge is important because the dysfunction of these neural circuits can lead to pathological conditions of chronic pain and itch. Our lab has recently developed a novel, semi-intact somatosensory preparation that allows us to probe spinal circuits with unprecedented power. This approach gives us, for the first time, the ability to record from the output neurons (via retrograde labeling of spinal projection neurons) while we control somatosensory input (via natural stimulation of the skin) and simultaneously manipulate activity of specific populations of spinal interneurons (via the combination of Cre alleles and optogenetics). The goal of our research is to use this newly developed physiological preparation to address long-standing questions in the field of somatosensation. How is itch distinguished from pain? Most aversive chemicals are not particularly specific: they can either cause pain or itch, depending on how they are applied. And yet pain and itch are experienced as distinct sensations. How does this work? Our central theory is the spinal cord plays an essential role in further disambiguating between these two aversive sensations. In particular, we hypothesize that distinct opioid subtypes—mu and kappa—are involved in sharpening sensory acuity by selectively inhibiting different subtypes of aversive somatosensory input. For instance, mu opioids, such as morphine, are known to reduce pain, but cause itch. 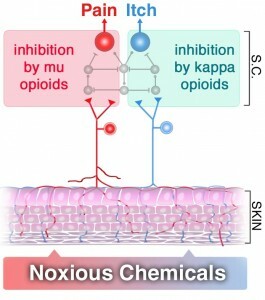 Conversely, recent work from us and others has revealed that kappa opioids, such as dynorphin, selectively inhibit itch, but not pain. Our lab is using genetic approaches to investigate how distinct opioid subtypes selectively modulate pain and itch. For instance, we have recently created genetically modified mice that allow us to visualize and manipulate the cells that express the kappa opioid receptor (KOR-cre mice). Using KOR-cre mice together with the semi-intact somatosensory preparation, we are dissecting the cellular and molecular mechanisms that sharpen sensory acuity. These experiments will help elucidate how complex somatosensory input is encoded to produce the distinct percepts of pain and itch. How does scratching relieve itch? Scratching is known to relieve itch, but the underlying neural circuits that mediate this effect are unknown. Our lab is trying to delineate the neural basis of this phenomenon. In particular, we can record from spinal projection neurons that are specific to itch. Importantly, we and others have found that scratching the skin temporarily inhibits the output of these projection neurons. Currently, we are using molecular genetic approaches to identify which subtype of spinal inhibitory neuron mediates this effect. These experiments have the potential to uncover the cellular mechanism for the inhibition of itch by scratching and could pave the way to the development of therapies to treat itch without causing skin damage. What mechanisms cause the abnormal amplification of pain? Wind-up was first described 50 years ago as a frequency-dependent increase in the response of spinal neurons upon repeated stimulation of afferent C-fiber input. However, while the synaptic mechanisms of wind-up have been studied in detail, the neural circuits that are responsible for this amplification have yet to be defined. Lorne Mendell, who first discovered wind-up half a century ago, suggested that this phenomenon may be due to the reverberatory activity in spinal interneurons that is evoked by afferent C-fiber input. “If in this period of time another stimulation arrives to the cord, it sums with the ongoing activity to produce a more intense discharge in the interneurons than the one before it.” Mendell, Exp. Neurol. 1966. Importantly, this singular insight implied that wind-up is a network phenomenon. That is, windup is the consequence of activity within a polysynaptic circuit. And yet, the circuit-based mechanisms of wind-up are completely unknown. We have identified a population of spinal interneurons that modulate wind-up. These experiments have the potential to uncover a cellular basis for the amplification of somatosensory input.